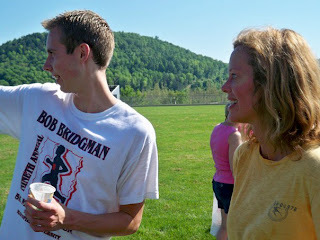 Today was the 10th annual Bob Bridgman Memorial Day 5k. It's generally the only official race that I run, so every year I try to beat my time from before. It has a reputation as a really hard course (half of it is straight up hill) and I have been told that whatever time you get on it, you could probably expect to do at least two minutes better on flat ground or a track. This year I was finally able to convince my Mom and sister to run in it too. That was nice, because besides them Ben, was the only other person I knew this year. Here are my Mom and I after the race. So that's always a fun thing to do on Memorial Day. In other news, I ordered a mandolin on MusiciansFriend.com. It isn't here yet because of Memorial Day, but when it does I will probably post about it. I kind of learned to play last Wednesday night at a campfire with some friends. I was always kind of interested in it, even before I took up guitar. I started thinking about it again this past fall when the Craggs, an Australian folk music band came to Mansfield and I talked to their mandolin player. So when I learned some chords the other night, I started thinking how versitile it is, and how I can take it just about anywhere because it's so small. So I bought an Ibanez A-style one. not to mention once you learn mandolin, you can practically play a violin. All you'd have to learn is the bowing. Really? I didn't realize the strings were the same. Andrew, you are incredible!!! :) love the mandolin too.